During the summer of 2010, I coined the phrase “The Danks Theory” for a lineup strategy employed by Tampa Bay Rays’ manager Joe Maddon. After having little success against changeup artists like Dallas Braden, Shaun Marcum, and of course, John Danks, Maddon went against the natural platoon split and began starting more like-handed batters against these types of pitchers. The intention behind this method appeared to be neutralizing his opponent’s best weapon, which was thrown more to batters of the opposite hand. The strategy actually dates back to 2008 when Maddon started six naturally right-handed batters and had two switch-hitters bat from the right side against Mike Mussina. For his career, Danks has been remarkably neutral against both types of batters. His FIP versus left-handed batters is 4.26 with a 4.20 xFIP. Against righties, he has an almost identical 4.27 FIP with an xFIP of 4.19. Meanwhile, in 2011, he has struggled with the increased amount of left-handed batters, posting a FIP of 5.46. Even his 4.47 xFIP suggests that the struggles are not just related to an increase in home runs allowed. Keep in mind we are talking about a sample size of 100 batters against lefties; however, those 100 batters have factored in his pitching slash line (ERA/FIP/XFIP) of 5.25/4.85/4.20 thus far. Although results are the end game, the process behind the Danks Theory is to take away the opposing pitcher’s best weapon – or in this case Danks’ changeup (his cutter is quickly closing in, but the changeup is still slighly ahead). According to the database at texasleaguers.com, the White Sox lefty has thrown his off-speed pitch 20.4% of the time since 2008. Breaking it down by splits, he has thrown it 24% to right-handers with a 16.6% whiff rate. Lefties have a similar swing and miss percentage (16%), but he throws it just 11% of the time against them. To get a better visual, here are some the heat maps located on John Danks’ fangraphs pitch f/x page. Those pictures tell you everything you need to know about who Danks throws his off-speed pitch against and where he puts it. What they don’t show is the pitches effectiveness. Since joining the league in 2007, Danks’ changeup has earned a 31.2 wCH and a wCH/c of 1.26. Both of those rank within the top 15 of their respective metrics (min. 650 innings). Again, a large portion of those nasty changeups have come at the expense of right-handed batters. It will be interesting to see how future opponents matchup against Danks. 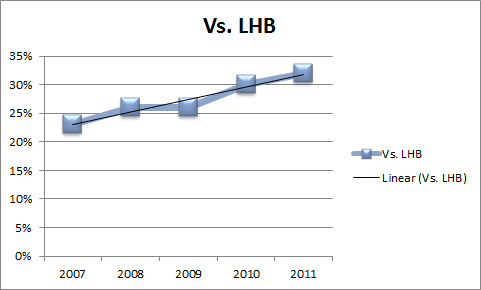 Meanwhile, as the chart from above shows, the usage of left-handed batters against him is trending upwards. In doing so, opposing managers are essentially limiting one of the best pitches of its kind before the first pitch is even thrown. We hoped you liked reading Is The Danks Theory Catching On? by Tommy Rancel! Right now opposing managers could throw the bat boy up there and Danks couldn’t get them out. He pitched into some bad luck thanks to the anemic White Sox offens in April but in May he was just brutal. 31.1IP, 40H. 14BB, 10K. Guillen was always big on loading the lineup with righties against Johan Santana. It just allowed the Twin to dial in the outside corner and throw the change exactly where he wanted to all day long without having to adjust batter to batter.